Now selling Can-Am Race Driven Brakes! Starting at $27.95! We are now selling brand new Race-Driven Severe Duty Sintered Metal brake pads for Can-Am Outlanders and Renegades years 2004 and up. 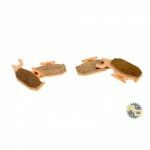 You will receive 2 sets of pads, enough to replace both front calipers. Come check them out!